As the stand-off between Anna Hazare and the government of India continues on the issue of the Lokpal Bill, Hazare followers are coming out with unique ways to garner support for the campaign (and also promote their brands in the process). While companies like Tantra and Inkfruit have been selling merchandise like T-shirts, bags and caps with anti-corruption slogans, game developers have come up with innovative games based on the Lokpal Bill issue. Here's a quick look at some of them. Geek Mentors Studio, a technology start-up, has developed an online game on the lines of the widely popular Angry Birds and the game is aptly called Angry Anna. As you may have guessed, the birds of the original game have been replaced by animated look-alikes of Anna Hazare, Baba Ramdev and Kiran Bedi while the pigs have been replaced with faces of politicians like P. Chidambaram, Pranab Mukherjee, Suresh Kalmadi and Prime Minister Manmohan Singh. At the start, a message reads: Some corrupt politicians are stealing our beloved nation's money; let's wipe out all of them. After that, the mission is simple enough. Just use the activists to wipe out the corrupt politicians (with a similar sling shot set-up used in Angry Birds) and win the game. There are four levels in the game, and the number of 'activists/birds' and 'politicians/pigs' will increase as the game progresses. If the user fails to clear the fourth level (which is usually the case), a message â€“ Anna can't do it alone. Do you support Anna for his fight against corruption â€“ is displayed on the screen, with an option of clicking 'Yes' or 'No'. The game does not include scores, which indicates that it has been developed to gather support for Anna Hazare's crusade against corruption and for users to take out their frustration against corrupt politicians. Within just two days of its launch (it was launched on August 24), the game has gained huge popularity on social networking sites like Facebook and Twitter. When we played it last, the 'Facebook likes' for the game had already crossed the 1,000 mark and the game was also one of the most popular trending topics on Twitter in India. Ibibo has also come up with an online game called Yes Prime Minister, based on Hazare's campaign. The game is similar to the popular Zynga game CityVille and you become the Indian prime minister, trying to build a corruption-free India. The user is provided with an initial budget and has to complete new tasks in order to make progress. He also gets to decide the policies of the country and builds schools and other relevant infrastructure. One can also invite and add his friends (again like CityVille). And just likeCityVille that has Samantha as a guide, here users have a sari-clad lady helping them out with various tasks. Another game inspired by Hazare's Lokpal Bill efforts is called The Anna Hazare Game and it is available on Krazykode.com. The game play is similar in to that of the popular Pac-man game. But this game uses the Indian political map as its background and has the Anna icon placed upon it. The objective of the game is to collect 10 supporters from across India, before the villains (read Indian politicians) can get to Anna. The Anna icon is controlled by the arrow keys and the user has to navigate him safely, besides gathering 10 supporters within the time limit of 60 seconds. Once you are able to achieve the goal, you get the ultimate prize "the Lokpal Bill. Krazy Koder is a free online lab for programmers, which allows them to code, compile and run their programmes online. It's another game which was available in the Android market until recently. But when we tried to download Furious Indians, a message was displayed across the screen that read: Unfortunately, as this app is no longer available on the Android Market, it can't be downloaded. Seek out related apps. An intentional blackout? It's for you to decide. We already have a Pac-man copy and now, Anna's version of Angry Birds hits the Web. So, the next one might be a fasting game based on Hazare's Gandhi-style fasting at the Ramlila Maidan in New Delhi. 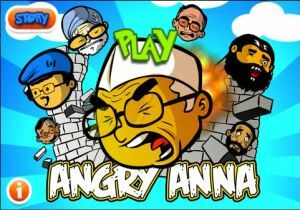 And the game might be featuring top Indian politicians trying to convince Anna to break his fast. Coincidently (but not related in any way), Nokia's new Symbian update is also called Symbian ANNA. The wonders never cease.